Last week I went to a new place called Sushiya with some friends. They had some pretty tasty sushi, and I felt inspired. This weekend I created some masterpieces at home. While I really love raw fish, it’s not easy to acquire and I don’t think I’m capable of handling it safely enough to not get in trouble. 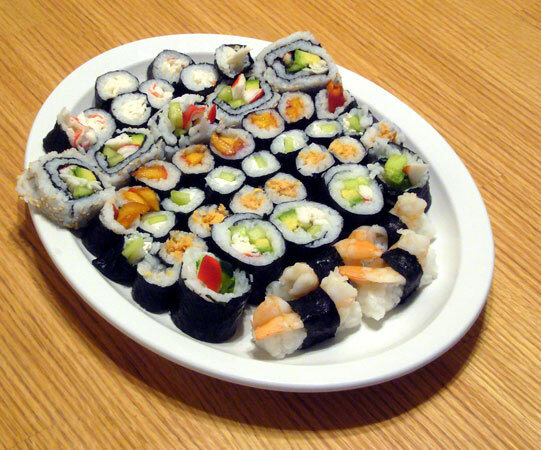 So the sushi I made didn’t have any raw fish in it, but I was still able to make a wide variety of rolls. Here’s a pic of most of the rolls. I didn’t have enough room on the plate for everything. Starting from the lower right, we have shrimp. Next is a fat roll of krab, avocado, and cucumber. Next is smoked salmon from my aunt and uncle, followed by cucumber and cream cheese. I played around with the seasonal fruit on the next roll, which is peaches picked from a nearby tree. After that is an inside-out roll with krab, avocado, and cucumber. Finally, there’s a roll with krab and mayonnaise. There was also a roll with krab, cucumber, and cream cheese, but that didn’t make it onto my platter. I mixed some wasabi and soy sauce and had a small plate of sesame seeds and watched a movie while I went to town on the sushi. It was a great night. In case you were wondering, the peach sushi was good, but not with the soy sauce.